Bestinet CEO, Ismail Mohd Noor at their press conference last Tuesday. Former Wangsa Maju MP Wee Choo Keong has urged the government to reveal details of other service providers involved in the recruitment of foreign workers. He said this to Free Malaysia Today, according to its article on 2 august 2018. 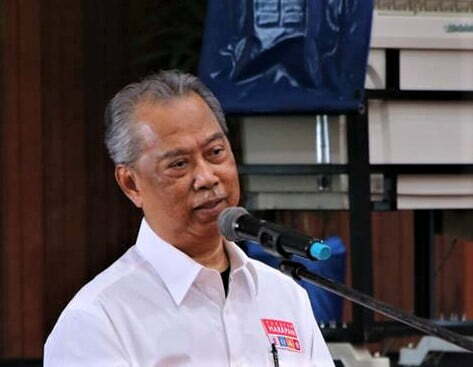 Home Minister, Tan Sri Muhyiddin Yassin is still recovering from a surgery. Bestinet Sdn Bhd, the IT company embroiled in the recent foreign workers scandal had been on the defense since it was alleged to have monopoly over the foreign workers recruitment in Nepal. 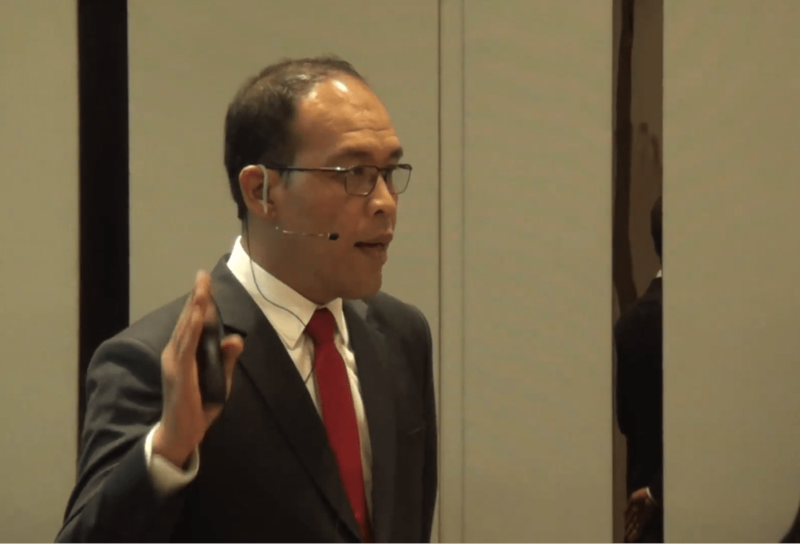 At a Press Conference held on 31 July 2018, Bestinet’s CEO Ismail Mohd Noor denied all allegations that they exploit or monopolize the foreign workers industry. “We are not involved in the recruitment activities in the labor source countries. This is entirely controlled by the respective governments and recruitment agents in those countries.” Ismail explained firmly. Ismail further explained Bestinet is only handling Health Screening while other services are provided by other companies. Immigration Security Clearance (ISC) – Being operated by S5 Systems Sdn Bhd, a company controlled by Dato’ Sri Johann Young and Tan Sri Al Amin Abdul Majid, a former Perak Umno Youth chief, Al Amin is a close confidant of former Prime Minister Najib from the time the latter was Umno Youth chief in the late 1980s. He dropped out of active politics to focus on business and sports. Tan Sri Al Amin was also Chairman of SME Corp until very recently, rumoured to have been part of the political appointees clearout by the new Pakatan Harapan government. One Stop Centre (OSC) – OSC are operated by few companies like Bukti Megah Sdn Bhd, and International Marketing and Net Resources (IMAN). IMAN is controlled by Dato Azri Mohd Zain of UMNO Segambut. Visa Luar Negara (VLN) – Reported by Centre of Investigative Journalism, Nepal (CIJ) to be operated by Ultra Kirana Sdn Bhd; a company controlled by Wan Quoris Shah, Amanah Raya via it’s ownership of Gabungan Kesturi Sdn Bhd and investor Harry Lee Viu Khiun via his company HRL Capital. 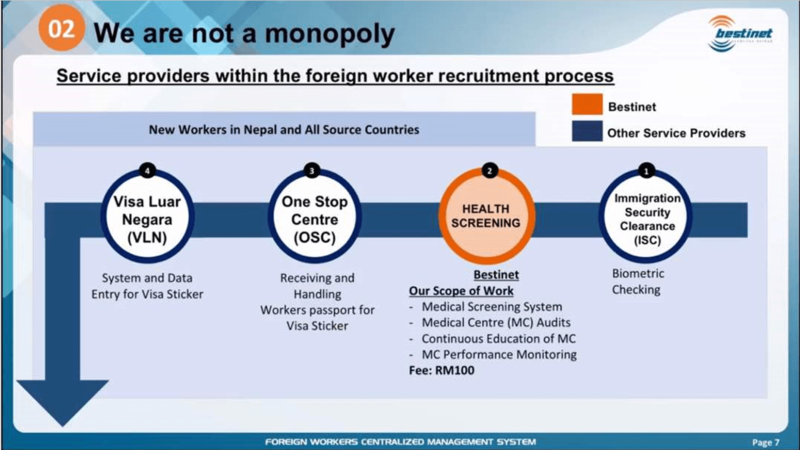 Aside from the main processes in source countries, there are other processes in Malaysia for Foreign Workers and PATI (Illegal Immigrants) / Undocumented workers. NMT managed to find out the companies behind these processes. Yearly Medical Screening – NMT do not currently have information on the parties handling this process. We however believe that these are medical centres approved by FOMEMA. 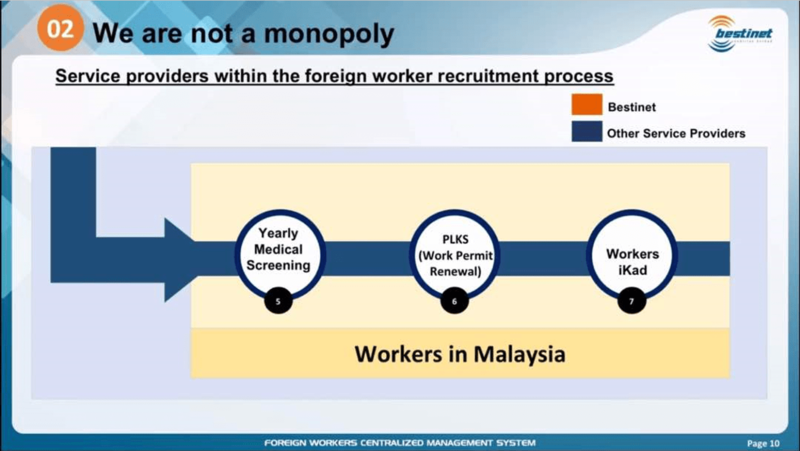 PLKS or Pas Lawatan Kerja Sementara – a Foreign Worker Permit Renewal is believed to be handled by more than one company. One of them is MYEG. It is reported by the Department of Immigration that MYEG handled 1.3 million applications in 2015, 1.5 million applications in 2016 and 1 million in 2017 for such work permit renewals. 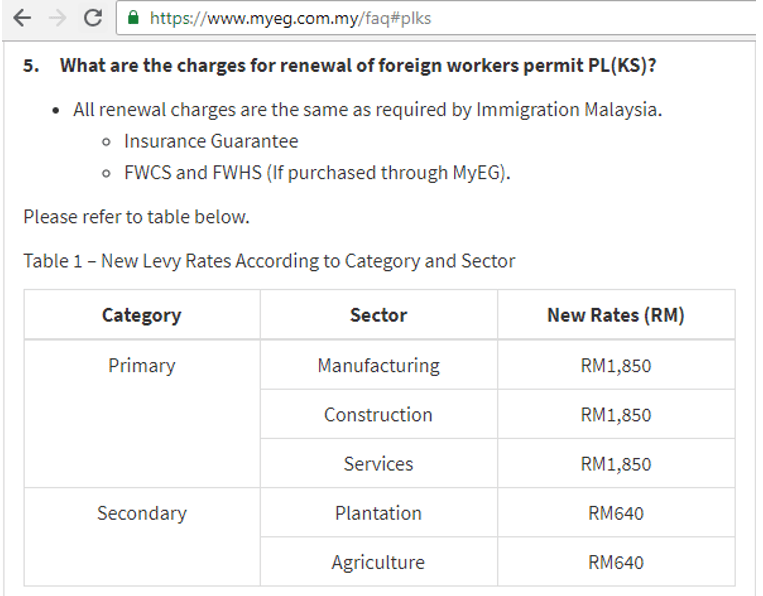 From MYEG’s own website, the levy charged for the renewals vary from category and sectors but they are either RM1850 for Primary Sectors (Manufacturing, Construction and Services) and RM640 for Plantation and Agriculture. MYEG is probably the biggest beneficiary of contracts from Department of Immigration. The company landed a RM553 million contract from Immigration in 2017 as reported by NST’s article MyEG Services gets RM553.85m project for online renewal of temporary employment passes. MYEG’s rise to greatness were backed by government contracts and close connections to the previous Barisan National government. It’s Managing Director Wong Thean Soon and Executive Director, former UMNO politician, Raja Munir Shah Raja Mustapha, were listed as one of top 25 richest Malaysians in 2017 by an article from The Star. Forbes listed Wong Thean Soon as #29 Richest Malaysian and MYEG’s Chairperson, Dato’ Dr Norraesah Mohamad at #49 on the Top 50 list. Dato’ Norraesah Mohamad was a Supreme Council Member of UMNO between 2000-2003 and was made a Senator in 2005. Workers iKad – NMT believe that the production of the iKad are outsourced to a third party. An article from The Edge Markets in 2014 confirmed that Datasonic Group Berhad was producing the iKad for the Department of Immigration. NMT have not been able to confirm if they are still producing the iKad for Immigration. Another process involved is PATI (Pendatang Asing Tanpa Izin) Undocumented workers Rehiring Program which are operated by at least 3 vendors. 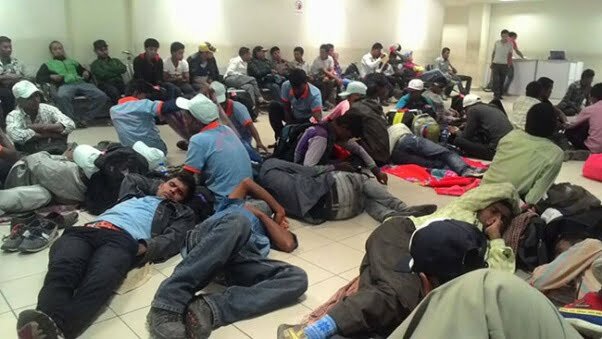 Department of Immigration had previously revealed that PATI Rehiring Programs are operated by few companies; Bukti Megah Sdn Bhd, International Marketing and Net Resources (IMAN) and MYEG. 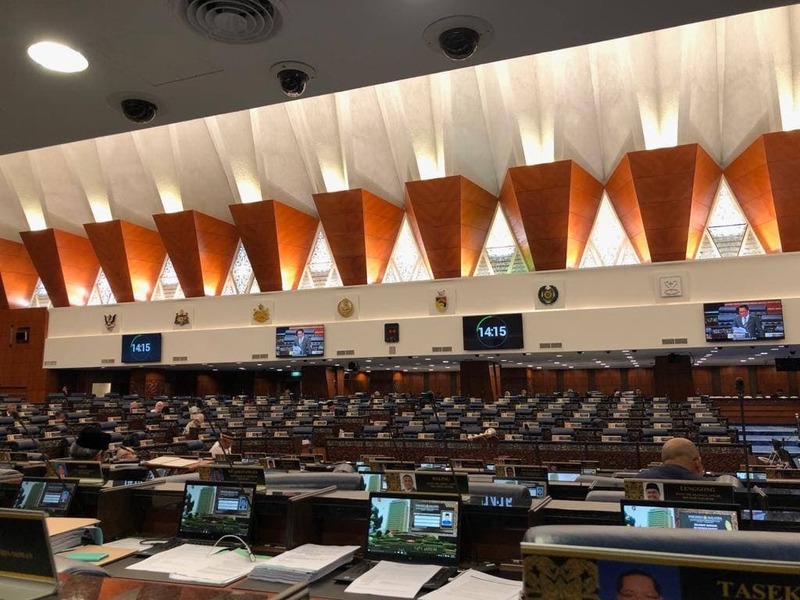 However, their contracts have been terminated in June 2018, as reported by The Star, a move by the new Pakatan Harapan government. In another development, The Star has apologised for inaccuracies of reports about Bestinet in its article, “Bestinet fails to reverse Nepal’s worker ban” published on Aug 1. The article drew the Nepali Embassy to issue a statement denying any meeting took place. Bestinet also issued a press statement denying to have said that they met with Nepali officials. It’s Press Conference was recorded in full and published on it’s Facebook page. NMT are following the foreign worker issues with great interest and will be reporting more about it in the near future. A comprehensive detail investigations will surely uncover the many schemes set up to exploit and screw monies from foreign workers and their employers. Find out where all the money trail lead to?